Weather this week was pleasant but below normal temperatures with only having one major rain event at the beginning of the week. Some guests did well Smallmouth Fishing while others did great catching Northern Pike. Dave, Dan, Jacob, and Jack Ellis from Traverse City, MI were here for their first time. First day out Dave & Jack caught 35+ Smallmouth Bass while Dan & Jack caught about 12 and after supper they hit a Mayfly hatch catching about a dozen good size Smallmouth fishing right in the emerging Mayflies. 2nd day Dave & Jacob caught 16 Smallmouth Bass before supper, 7 being over 17 inches and Jake caught an 18-inch Master Anglers Trophy Bass while Dan & Jack caught 9. They said moving was the key as they were only catching one fish per spot. 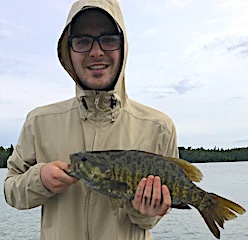 3rd day was another very good quality Smallmouth Day catching all bigger fish 16 to 18.5 inches and Jake again came up with the trophy. 4th day when I asked how their day was at suppertime they all said, GREAT!! 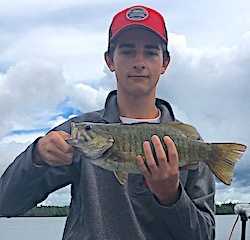 They caught a good number of quality Smallmouth Bass in the 16 to 17 and 7/8 category and Jack landed a beauty Master Anglers Award Trophy at 18.5-inches. The rig of the day was the Zieka Rig. 5th & final day was there best and David said conservatively they caught 45 to 50 Smallmouth Bass and Jake caught his 3rd Master Anglers Award Trophy Smallmouth. All had a fabulous time making wonderful family memories together. John Papp and son Michael from Atlanta, GA were fishing at Fireside Lodge for their first time. 1st day they caught some Pike & Smallmouth Bass while getting to know the waters. 2nd day had them again catching a mix of Northern Pike and Smallmouth Bass having fun learning locations and presentations. 3rd day was there best catching a bunch of Northern Pike, a few Smallmouth Bass and enjoying the creek ride to Maskinonge Lake and at the end of the day Michael had a slight edge over his dad in their personal contest. 4th day they had a ball investigating the Little Vermilion Lakes Upper Arm catching Smallmouth Bass & then turned to the West End catching many Northern Pike and at the end of the day the contest was tied. 5th day when asked at supper John said they had a really fun day catching over 30 Northern pike together and the smiles on their faces told the whole story. 6th & final day finished with their strongest day catching 51 fish total, 49 pike and 2 Smallmouth Bass. Mike expressed what a great time they had and have all intentions of returning in 2018. Ollie & Bob Waldeck from Cotter, AR were continuing their 2nd week stay starting out by having a fantastic day catching 40 Northern Pike and 2 Smallmouth. 2nd day was a 15 Smallmouth Day with half on the bigger side. 3rd day was even better landing 30 Smallmouth Bass and Ollie had an absolute ball catching most of hers on the surface using a Tiny Torpedo. 4th day was very special catching 13 Northern Pike but the special part was catching 12 Smallmouth with 10 being 18 to 19.5-inches. They were using a Z-Man Popper and had three times as many miss the lure. 5th day had them catching some Smallmouth but they found it to be a challenging fishing day. 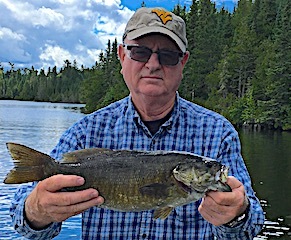 Next day was a super day Smallmouth Bass fishing as the bass stared to show up on rock reefs and islands which is the 1st movement to the summer pattern. These two caught 42 Smallmouth Bass most being bigger in size using the sinking worm. Last day they ended very strong catching 44 Smallmouth Bass. The last two days successes were on a floating worm attached to a weighted hook that allowed them to crawl the worm on the bottom with minimal snags. Both had a wonderful two week stay and upon departing reserved the same two weeks for 2018. First time guests James Head from Miromar Lakes, FL & Brett Berty from Indianapolis, IN were excited to be on new waters. First day was spent getting familiar and catching a few Pike and Smallmouth. 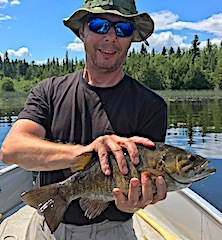 2nd day was terrific catching, as Brett stated, dozens & dozens of Northern Pike plus they caught 4 Big Smallmouth Bass with Brett catching a Trophy while fly-fishing. 3rd day was almost as good as there second catching 35 Pike plus they caught a few Smallmouth Bass with James landing a Trophy 18-inch Smallmouth Bass. 4th and final day was fabulous catching a bunch of Northern Pike and a lot of Smallmouth Bass with 6 being between 18 to 20-inches. Both were very excited when explaining their catch in the dinning room. They said about 70% of the fish caught over 4 days were landed while fly-fishing and Bret caught over 75 fish just using two of the same flies. Return guest since 2003 Ed Bromeier was back with good friend Gary Tuberty both from Boone, NC. 1st day these two spent catching some nice Smallmouth Bass and Pike. 2nd day was a super day catching 43 Northern Pike & having at least 20 misses. 3rd day they got into catching Smallmouth Bass with a few Pike mixed in, and Gary had a Pike hit his Baby Torpedo. 4th day was another great Northern Pike fishing experience catching close to 40-Pike and Gray caught his 1st Northern Pike Fly-Fishing. 5th day was a fun day catching Northern Pike and Smallmouth Bass with surface lures. 6th and final day was a FABULOUS finish to a fantastic fishing trip as they got into a bunch of Northern Pike catching over 40 and it was so good these two where late for supper because the fish just would not quit. Both left thoroughly enjoying their stay hoping they will have another opportunity to return. New time guests Ric Klingler, Lisbon, IA, Douglas Current, Melbourne, FL Tom McDougall, MN and Mark Hendersen, Ft Lauderdale, FL. 1st day Ric & Doug caught Pike & Smallmouth Bass while Tom & Mark focused on Northern Pike catching 20. 2nd day the group caught many Northern Pike while catching some Smallmouth Bass. 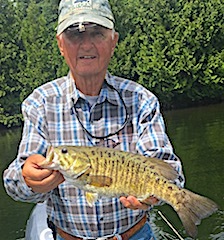 3rd day Doug & Ric caught 50+ Smallmouth Bass while Tom & Mark caught a mix of Northern Pike and Smallmouth Bass. 4th day Ric & Mark were searching for Muskie and hit many spots not catching any Muskie but caught a good number of sizable Northern Pike using suspending and sinking twitch baits. 5th day wind was a factor causing their production to be down but all caught fish and were happy at suppertime. 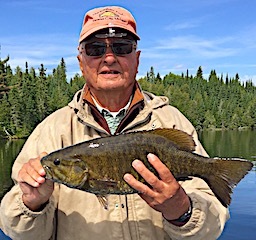 6th & final day all did well with Ric & Dough doing very good on Smallmouth Bass, Doug landing 3 Master Angler Award Trophy Smallmouth 18 to 19.5-inches. Great finish to a great trip and when checking out there was talk about next year by Ric. Returning for their 8th time were David Jewell, Wendell Hill, Bob Nutter, & Todd Plumley from Pineville, Foster, Clarksburg, and Hamlin, WV. 1st day they knocked it out of the park catching over 150 Smallmouth Bass, Bob catching 3 Master Anglers Award Trophy fish over 18-inches, with the majority being caught on #3 or 4 spinners. 2nd day this group caught 128 Smallmouth Bass mixing in a few pike, David catching a Muskie and loosing a BIG Muskie, and Todd had the top day Smallmouth fishing with 48. I guess returning for 8 year spays off? 3rd day was a Northern Pike fest for Todd & Wendell catching over 50 while Bob & David stuck with Buzz bait catching about 20 but losing near 30 fish, but every time a Pike slams a Buzz Bait on the surface it is just as good as catching one. 4th their numbers were down because of windy conditions but they did catch some quality fish. Dave had a story as a Pike after biting off the line above his Baby Torpedo started to push the loose floating Torpedo and David reacted by throwing out a whopper plopper, which did get the fishes attention and enabled him to retrieve his lure. Todd also had a fish story. While catching a small bass a Muskie attacked the bass engulfing it, then with a headshake the bass came free to swim away and Todd then had the Muskie hooked and landed it. 5th and final day was a good day for both Northern Pike and Smallmouth Bass ending their trip and had them already thinking about next time. The Klimes family Group returned for their 5th consecutive year headed by Brian & his boys Zach, Tyler, & Jordan from Willow Brook, IL, his brother Kenny from St Louis, MO area, brother Kerry & son Kody from Phoenix, AZ & Geno Dombrowski from Orland Park, IL. 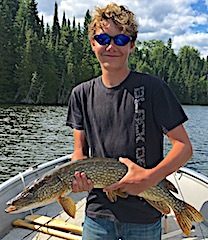 1st day out was a great start catching Northern Pike, Tyler catching a very thick 33-inch Muskie while Jordan caught a Master Angler Award 41-inch very heavy Northern Pike. 3rd day was very windy but all still managed to catch fish with Brian, Geno, Zack, & Jordan doing the best catching some good Northern Pike in quest for Muskie. 4th day was a good day for all with Kenny & Jordan doing exceptionally well on a great lure from the past, a 7-inch Suick. 5th day highlights had Kerry catching a 34-inch Pike, Kody a 32-incher fly Fishing, Kenny & Geno caught 20 Northern Pike and Brian and his boys caught Northern Pike while on a serious Muskie Quest. 6th and final day Brian, Zach, Tyler, & Jordan knocked it our of the park catching over 20 Northern Pike & over 30 Smallmouth Bass with both Zack & Brian catching trophy Smallmouth Bass. Zach’s being huge and his personal best measuring 19.75-inches. This concluded another Traditional Klimes Family Fishing Trip making another set or wonderful memories together. Thanks for choosing Fireside Lodge for your special annual family fishing event. Jack Guin returned for another trip with us at Fireside Lodge bringing his son-in-law and grandson David and Jackson Vest all from Huntsville, AL. This group did very well the 1st day catching 20 fish by suppertime 12 Pike and 8 Smallmouth Bass. 2nd day was a pike bonanza catching 91 total for the day. 3rd day these three caught 18 fish all together, with Jack catching an 18-inch Trophy Smallmouth Bass & David an 18.5-incher. They also had a great time having shore lunch. 3rd day they caught about 20 Smallmouth Bass & Pike. 4th and final day was a strong finish as they caught over 75 Northern Pike. All had a great time making family fishing memories. Gene Little from Knoxville, OH son Eric from Fairfax, VA and Jake Massie from Hamilton, OH were very excited to be at Fireside Lodge for their 1st time. 1st day they did well catching 12 Northern Pike and 4 Smallmouth Bass. 2nd day they caught 15 Northern Pike exploring the West end of Little Vermilion Lake. 3rd day was a great day catching 34 Northern Pike and Eric had a super large Smallmouth Bass on and up to the boat but it shook loose just before they could net the fish. Next cast he caught what we believe was the smallest Pike possible to catch. That’s fishing!! 4th and final day they set out in search of a trophy Muskie or Northern Pike and despite their best efforts it was not to happen this time but all agreed that they will come back in the near future to settle the score.